Brok the Brachiosaurus is the one in charge! 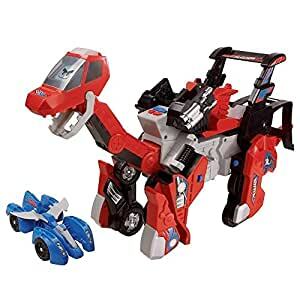 Brok is a 2-in-1 dinosaur from the Switch & Go Dinos crew by VTech. 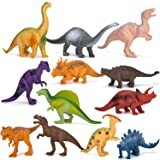 This electronic toy fuses dinosaurs and vehicle into one awesome play experience that your child will love! 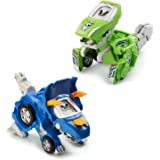 The VTech Switch & Go Dinos Brok the Brachiosaurus easily switches from a massive car carrier to a dinosaur and back again in just a few simple steps. 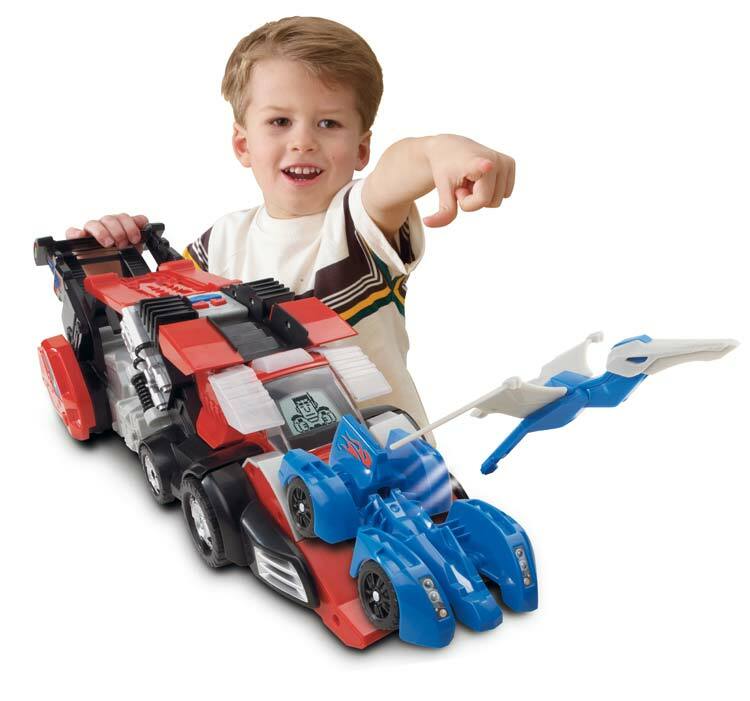 In vehicle mode, load up and carry your favorite Switch & Go Dinos or launch the included race car and pterodactyl into the air. 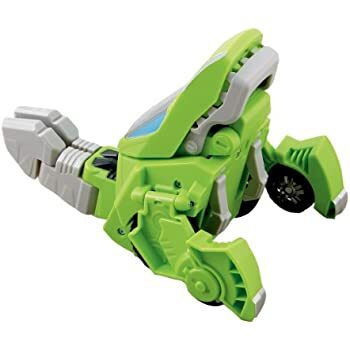 In dino mode, Brok stomps his feet when you push him along and kids can move his motorized neck. 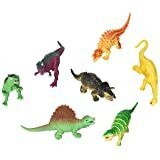 Brok's LCD screen plays animations and 80 sound effects and phrases that teach dinosaur facts. 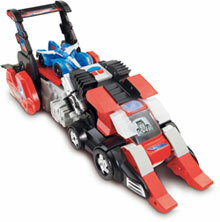 In car mode, Brok can carry around your favorite Switch & Go Dino toys. View larger. Send the included Pterodactyl toy into flight with the launcher. It's easy to switch the car carrier into Brok the Brachiosaurus with a couple of adjustments. Pull out Brok's neck and he switches his LCD screen into dino eyes. 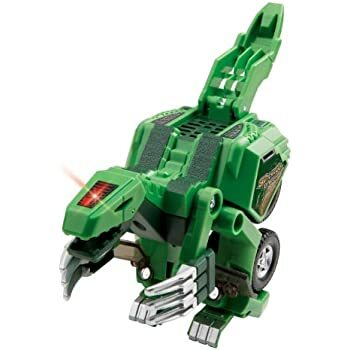 In dino mode, Brok moves his motorized neck when you push a button and stomps his feet when you push him along. 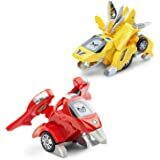 In vehicle mode, load up and carry your favorite Switch & Go Dinos (not included) or launch the included race car and pterodactyl by pushing on the spoiler. With just a few quick adjustments, Brok transforms into a massive dinosaur that spouts facts about prehistory. View larger. The LCD screen displays driver and dino eye animations that can be customized with a push of the style button. Six different driver styles and dino eyes are available. 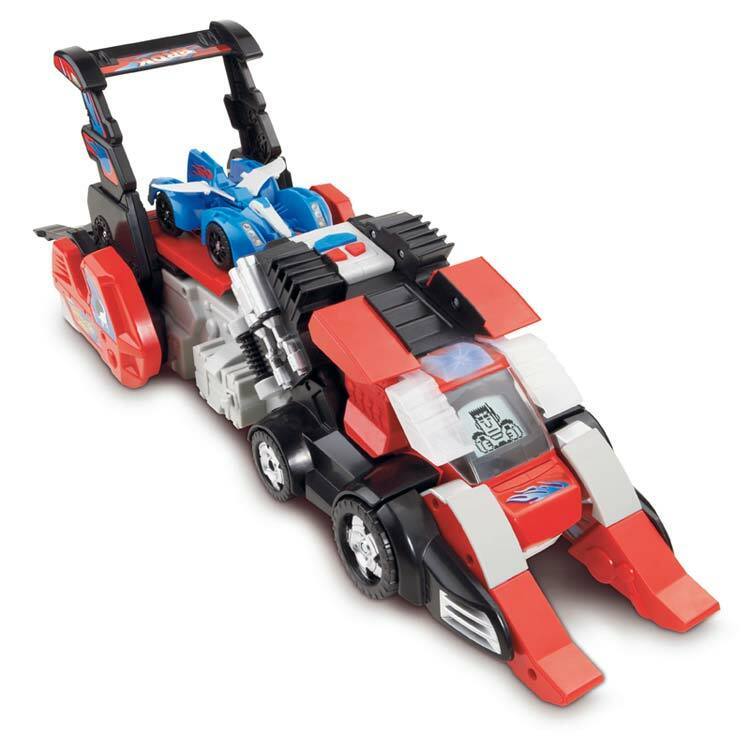 Push the sound effects button and, in vehicle mode, hear the big rig horn and engine sounds. 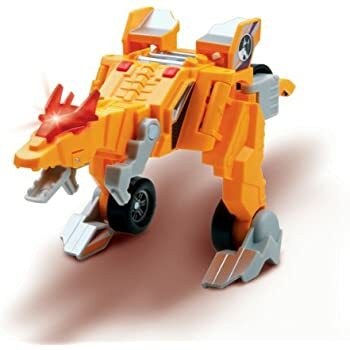 In dino mode, listen to Brok growl, roar, and breathe. Press the talk button to hear the dinosaur or driver talk. Let Brok teach you prehistoric facts about dinosaurs. Brok has three volume settings to accommodate different play environments. If he is not played with for an extended period of time, Brok automatically shuts himself off. Our testers found it easy to switch the car carrier into a dinosaur by following the instructions. 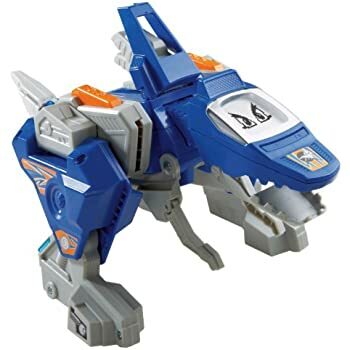 The toy was responsive and switched into dino mode when the neck was extended. After the first switch, kids will not need to use the manual. The toy is well designed and proved to be durable during play. 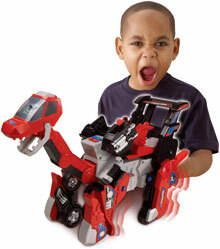 Vtech Switch & Go Dinos Brok the Brachiosaurus, four AA batteries, and user manual. Is a big toy. So make sure you have plenty of space for it. Is over price. I wish they understand is a toy . For $70 bucks. Now when it says "you command him " or tell him what to do" . Not really that's what I don't like. You have to press the switch and repeat what he says. Is not like he recognize the voice. mislead the buyers. That's why am giving 4 stars . But my son can spend hours playing thinking he is talking back at him. . Remember you have to press the talk switch . And repeat. I guess. 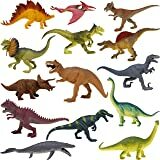 My son loves this dinosaur. It's huge compared to the other Switch & Go Dinos. 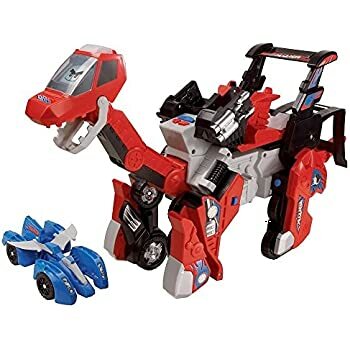 I gave it 3 stars because it's more cumbersome to switch back and forth from a truck to a dino than the smaller dinos and my son gets frustrated when he can't do it on his own. Also the car launcher doesn't consistently work smoothly and instead of shooting off straight it the car often falls off to the side. I'm glad my son loves it I just wish it was easier for him to use on his own. Most expensive piece of plastic to ever buy. It does not stay in dino mode. 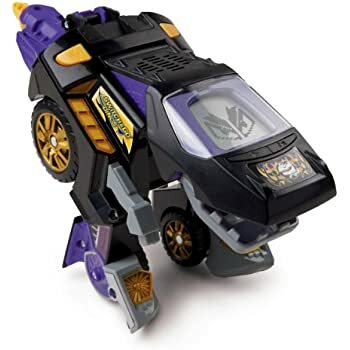 At first, it wouldn't even switch to dino mode and once we finally got it switched, it just kept switching back to vehicle mode. The neck doesn't move up and down like it's supposed to. 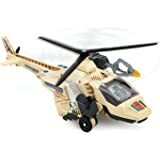 My son spent months saving up for this toy and is disappointed that it doesn't work like it's supposed to and of course we're past the return window so now we're stuck with an overrated piece of junk that doesn't work! 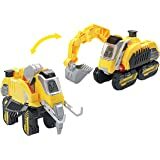 Got this for my 3 year old for Christmas from Santa. He loves it although I think my husband & I like it more. The voice commands are easy & the T-Rex tells some pretty cheesy jokes when you say "Jagger Make Me Laugh". Jagger has an on/off switch & there's additional buttons for giving commands, firing the missile he comes with & other features. Due to his size, he's rather clunky to transform from T-Rex to Truck & back again. So I have to do that as my son can't lift him up to setup Jagger's legs. One oversight on my part is we don't have much for smooth floors, so Jagger/the truck doesn't get to go very far when you tell it to "Go Forward". The only other downside is Jagger doesn't understand my son when he gives it commands, so that's left to my husband & I. You must speak VERY CLEARLY & there's times Jagger doesn't even understand us. 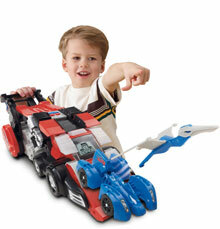 But it's a fun toy that I think will grow with my son versus some of the other 3+ toys out there. Only other recommendation, get rechargeable batteries for him. We played with him for about 3 solid hours Christmas morning & had to change the batteries. But don't let that keep you from purchasing this - Jagger does quite a bit using AA's. 5.0 out of 5 starsBig Brok is a hit! Excellent purchase! we love Switch N Go's and this one is a hit! He loves that his other smaller switch n go's can ride on the carrier and he can "shoot" them off on the ramp. he also loves that when he pushes the dino the feet actually move so it appears that the dino is walking. this was a great purchase! VTech is not a stranger in our home. With my two oldest being 17 and 15, we have had a lot of VTech products over the years and they company itself has never disappointed us. 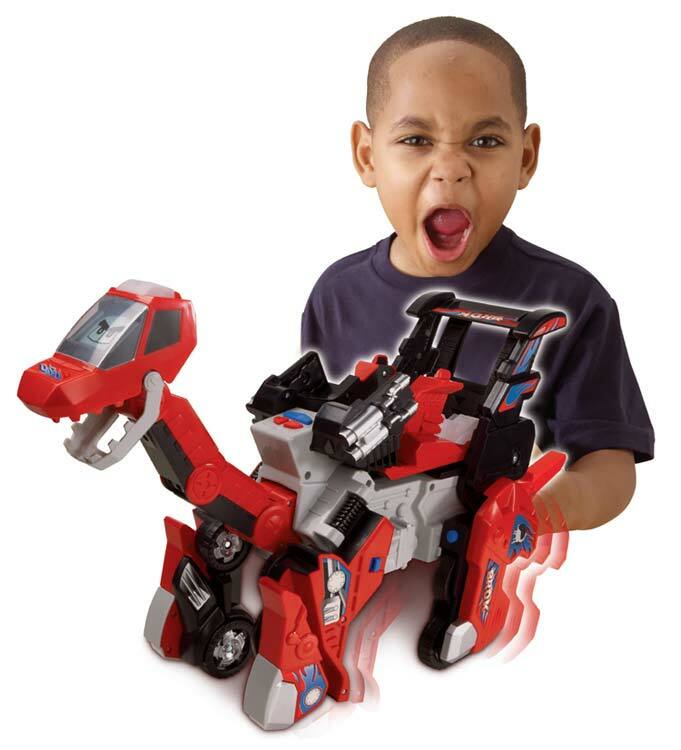 This was the first selling point in choosing the Switch and Go Dino Jagger for my soon to be 3 yr old son for Christmas 2013. 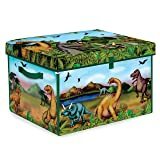 I knew it was going to be a pretty big sized toy and I knew my son would love a huge dinosaur. When we took it out of the box, I wasn't surprised how big it really was. With the hefty size though, he is a bit heavy. My son can't pick him up and carry him just yet. My son gets a kick out of the voice and the chomping mouth. While he is too little to appreciate the facts or the jokes, he still loves hearing Jagger make noise. The voice commands are ok. I knew at my son's current age, he would have problems making Jagger understand the commands, but for now we help him out. I do wish Jagger's mic was a bit more sensitive. Sometimes we have to yell at him to make him respond. 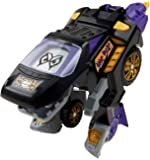 Transforming him from dino to vehicle is relatively easy for us but right now my son needs our help. 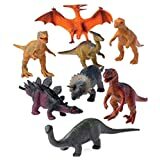 I do wish dino mode wasn't so "jiggly" feeling though. His moving legs has pinched my finger twice now while carrying him and as I have to make sure my son doesn't get his piched while trying to pick him up. I'm just eh when it comes to him moving. Forget about putting him on carpet. He won't budge. Sadly, this limits play to the kitchen downstairs. And that's where he has remained since Christmas day. With that being said, it frustrates my son when he tries to get him to move anywhere other than the kitchen. Overall, he is kinda cool. An older child will enjoy what Jagger has to say and the fun of 2 toys in 1. My son will enjoy this feature as he gets ages. The fact that we have trouble getting Jagger to hear the commands and that he has become part of our kitchen décor has taken 2 stars. For the price, I don't think I would repurchase had I given him a go ahead of time. For the first time, a VTech toy is going unloved in this home.